The Cavro Fusion Software application gives users the ability to easily connect to and operate Tecan Cavro modules through any Windows®-based PC. The application includes both a graphical user interface (GUI) for beginners to perform discrete tasks, and a scripting environment for advanced users for writing automated scripts, bench testing, application testing and on-site troubleshooting. 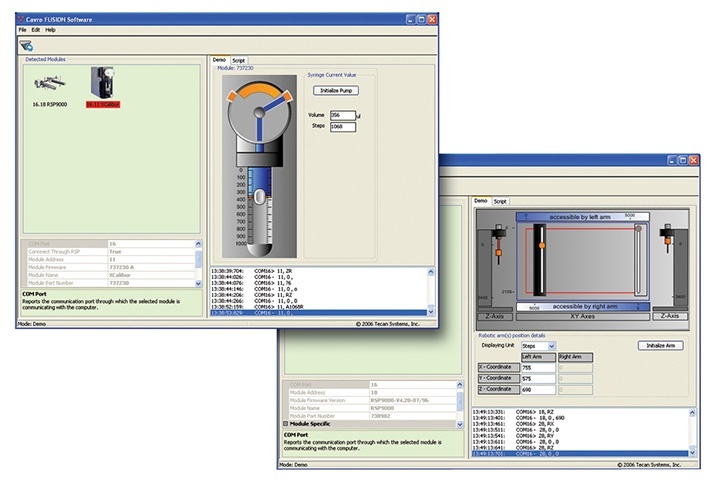 The Cavro Fusion Software automatically identifies the communications port to which your Tecan Cavro component is connected, and automatically recognizes all installed devices. This software is available as an evaluation tool and is not intended to be used as an application software.